Last week was parent-teacher conferences at the boys’ elementary school. Ahhh, conferences. A time to discuss your child’s insistence on having everything HIS WAY (*cough* Boy #3), see a myriad of test scores and more test scores (I’m lookin’ at you, No Child Left Behind!) — and snoop in your kid’s locker (not necessarily endorsed by the school). On the way out of the classroom, I spied Boy #3’s locker and said, “Is it okay if I check his locker real quick before I go?” I had suspicions that at least one jacket was camped out in there, forgotten after a cold-morning-but-warm-afternoon day. But when I opened the locker door, I realized I was not prepared for what I would find. There were several hanging on hooks and several on the floor, and they were all Boy #3’s. I was not only unprepared mentally for what I would find, but unprepared physically too. My face flushed as I passed a family in the hall, my arms loaded up with sweatshirts, jackets and mittens. As I walked by the office en route to the parking lot, I noticed two long tables, beside which hung a huge sign: “Parents! If it’s not at home, it’s probably here. 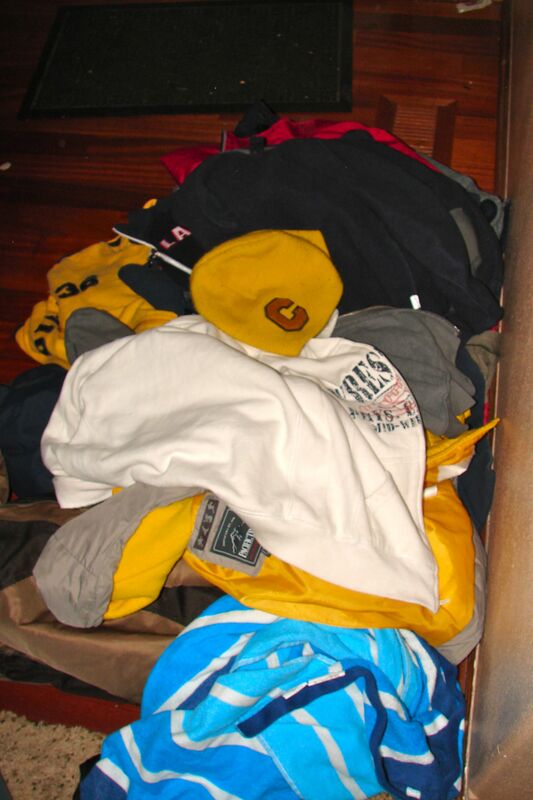 Please check our Lost & Found!” I felt my stomach sink as I glanced at the orphaned clothing items on display. Oh, how I didn’t want to, but I knew I had to stop. The first thing that caught my eye was a navy blue jacket with “ENGLAND” printed across the front. An unusual jacket, and coincidentally, one that I had just found at a local thrift store for Boy #2. Hmm…what are the odds that someone else has this same jacket, I wondered. But when I spotted another sweatshirt of Boy #2’s, I knew that both jackets belonged to my kid. As did the stocking cap with a “C” on it. As did the navy blue gloves with the orange flames. As did the OTHER sweatshirt. But, as you can imagine if you’re at all familiar with my life, it gets better, folks. Yep, remember I had only raided Boy #3’s locker and the Lost & Found. I hadn’t yet made it to Boy #2’s locker. Fall jackets in several different weights? Check. Winter coat that’s two sizes too big because you had left all your other coats at school and so had to wear your older brother’s coat because there was frost on the ground and your mom didn’t want to get turned in to DHS for sending her kid to school without proper weather attire? And, check. Think I’m exaggerating? Do 16 coats, 2 pairs of gloves, 1 single glove, 2 hats and 1 beach towel lie? Am I the only one? Or is anyone else raising a brood of hoarders? HA HA! I can so relate! Preschool and sitters have been okay, because they get help with taking things home. But this problem is something I surely have passed on to my children. Totally me, I am a hoarder, and the “mother’s curse” is strong! (I hope you have kids JUST LIKE YOU someday!) Kindergarten will be interesting! Hi Paula! I know you can’t control the lockers but I think eliminating them would solve a portion of your problem. I can’t believe they have lockers for kids that young. Our district doesn’t provide students lockers until they are in the middle school 6th-8th grades. Don’t get me wrong there’s always a huge lost/found table & my boys forget things all of the time but very seldom do they forget coats or sweatshirts. Each classroom still uses the Cubbies with hangers underneath for each student so everyone can kind of back each other up if something is left. I’m sure there are lots of other parents who had to make a couple of trips after conferences. Glad you raided the lockers!! I am not kidding you, it is like we live parallel lives. A few weeks ago I went to school and while I was waiting for the boys I found two jackets in the lost and found. Then when I went down to C’s classroom to pick him up I asked him if he had any more jackets in his locker. He had 6. Ooh, that would be good, Jenny! One less place for the kids to hide the coats. And for the record, today it was about 30 degrees with a 200-mile wind and my 3rd grader came out of school without coat, hat or gloves. Aaaahhhh!!! !